Let your clients know how much you care by making a donation in honor of their lost pet. 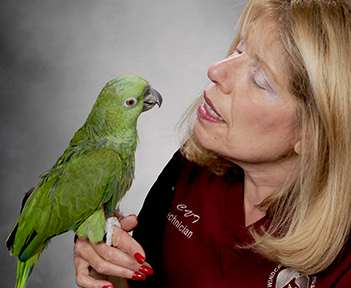 After completing the form below, you will be directed to a page where you can submit your memorial donation to the AAV Companion Bird Health Fund. Upon receipt of your donation, AAV will mail a personalized letter (including the optional statement from you if provided below) to the pet bird owner. This is a nice way to show your sympathy to clients while supporting avian research to improve the lives and well-being of the birds we all love. Note: If you are a third party submitting this form on behalf of the veterinarian, you will enter your name and contact information in Section 2. This section should only be completed if this donation is being made by an outside party on behalf of the patient's veterinarian, otherwise please leave blank and proceed to section 3. Would you prefer to remain anonymous?If you prefer that your name NOT be mentioned on the letter to the bird owner, please select Yes and your name will not be included on the letter. Amount to be donated (in US $) *After submitting this form, you will be redirected to the donation submission form to complete your donation. Optional Personal StatementIf you wish to include a personal note in the letter please enter it here. This is optional.